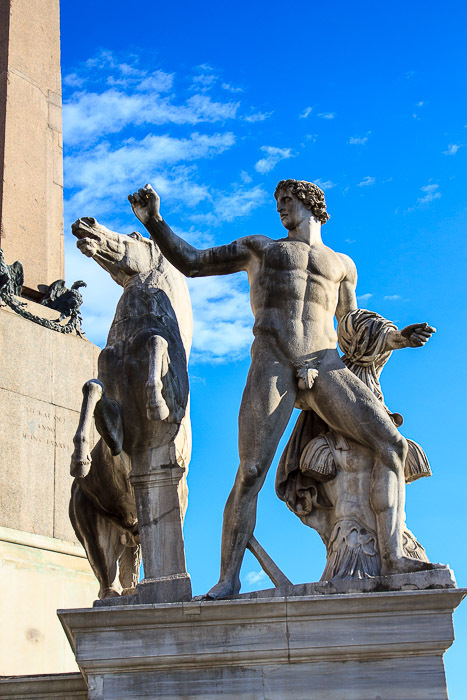 The Fountain of Castor and Pollux is the fountain surrounding the Quirinal Obelisk in front of the Palazzo del Quirinale, the official residence of the President of the Italian Republic, in Piazza del Quirinale. It is named for the two 18-foot-tall statues of the Dioscuri, Castor and Pollux, which stand beside the fountain and the obelisk. Those statues originally came from the Baths of Constantine which were located in this same neighborhood, and were Roman copies of Greek originals from the fifth century BC. They depict Castor and Pollux as horse tamers. They were moved here for the original fountain which no longer exists, commissioned by Pope Sixtus V in 1588. In the 1780s Pope Pius VI commissioned Antinori to improve the layout of the piazza. 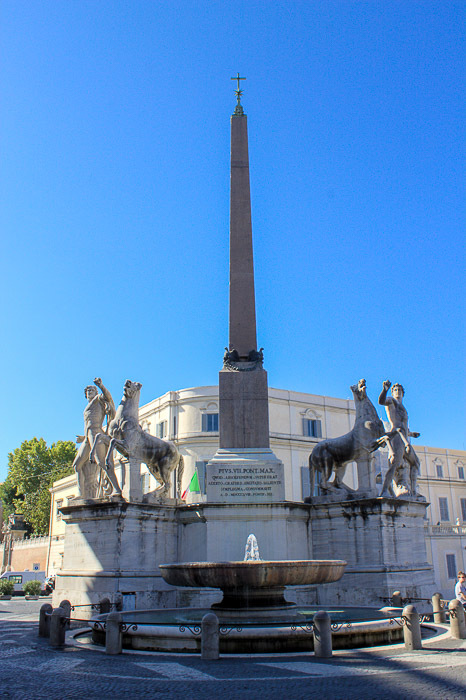 He moved the Quirinal Obelisk from where it was discovered near the Mausoleum of Augustus to its current location in this piazza, and he had the fountain and the Dioscuri moved to their places surrounding the obelisk. 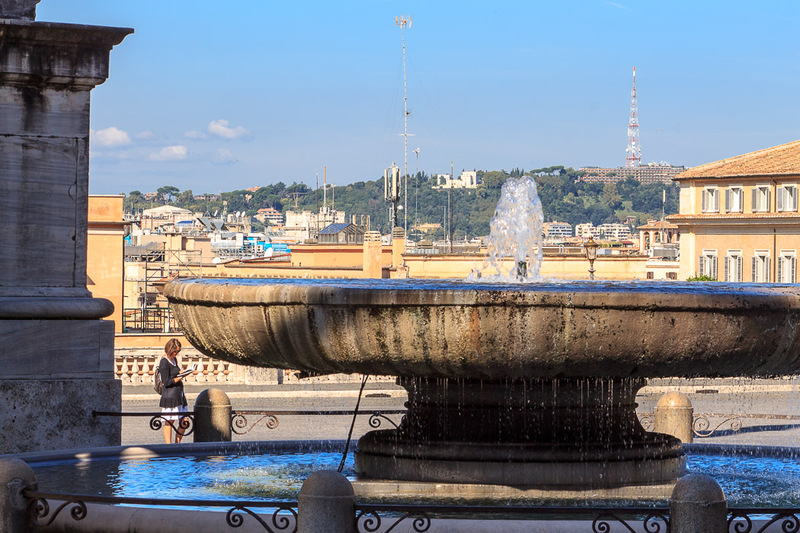 Somehow the original fountain became lost, and Pope Pius VII commissioned Raffaele Stern to build a new one in 1818, which is the fountain we see here today. It reused an ancient granite Roman shell that was found beside the Mamertine Prison in the Roman Forum in 1587 where it had been turned into a drinking-trough for horses until it was moved here for the fountain. That basin originally held the colossal statue of the river god Marforio. That shell stands on a short stout baluster which stands in a round basin. So the three components found here: the obelisk, the statues, and the stone basin, are all objects that survived, mysteriously intact, from the days of Imperial Rome. 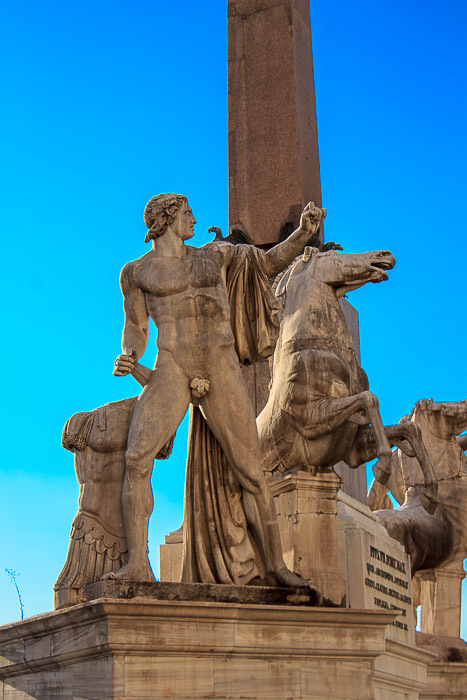 Although the fountain is certainly overshadowed by the obelisk and the statues of the Dioscuri, it adds to the scene with it's jet of water which gets blown about in the wind after being thrown upward between the heads of the rearing horses. See all Fountain of Castor and Pollux photos.